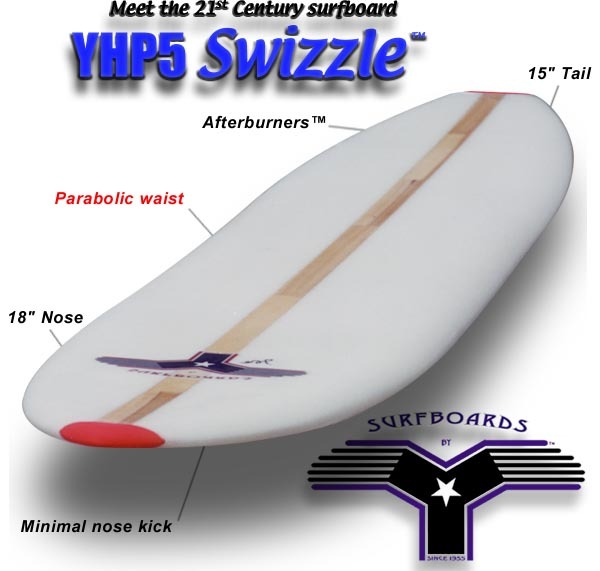 The SWIZZLE is a new kind of surfboard made from new materials by long-time surfing innovator Tom Morey, who now goes by the name of "Y." "This refined shape along with optimization of new age materials produces the high performance, resilient, YHP5 SWIZZLE," he explains. With an 18 inch nose and a number of important characteristics you've also got a noserider. "It's the best noseriding board I've ever made," said Y when he recently spoke with noseriding.com. Jimmy Gamboa does a go-behind on Herbie Fletcher at Malibu riding the new YHP5 SWIZZLE. Gambo is test riding and had a ball. This shot is from a sequence where he and Fletcher have been doing a series of go behind and cut back weavings. Photos By John Austin and Andy Cooper. PARBOLIC RAILS allow the board to dynamically climb or slide up or down the face of the wave. These parabolic rails are similar to those of the modern high performance skis. AFTERBURNERS utilize bodyboard's well proven skegless turning capability. They provide unique flow release edging which give you increased glide speed. This rapidly converts to turning drive when you bank into a turn. Same principle that allows bodyboarders to cling to the absurdly steep faces of Hawaii's Banzai Pipeline. "How do you I like the swizzle? I borrowed it for three days and gave it back two weeks later when Matt (son of Y) took it from me!" All time great surf legend. The SWIZZLES advanced shape is rendered in an entirely new array of high performance materials. The elastic skin provides a sturdy yet supple ding resistant shell that allows the uncrushable core to provide friendly comfort and greater safety. The sturdy composite beam, capped at both ends with soft water proof foam for safety, gives SWIZZLE its stable feel. 99% polypropylene foam beads @ 31 psig, and 1% compressed air, designed to withstand tremendous amounts of pressure. 1.Used for the body of the SWIZZLE forming an uncrushable core. 2.Used in car bumpers for its resilience and substantial pressure absorbing ability. 3.100% memory, indents then reform. Composed of UV cured polyester flex resign and specific aircraft, satin weave 7, harness glass. 1.Provides supple, soft, bend able surface. 2.Gives structural framework, strength, and flexibility to the skin. 3.Great for knee paddling with no pressure dings. Rigid leaf spring, full length, composite beam capped by soft ends. 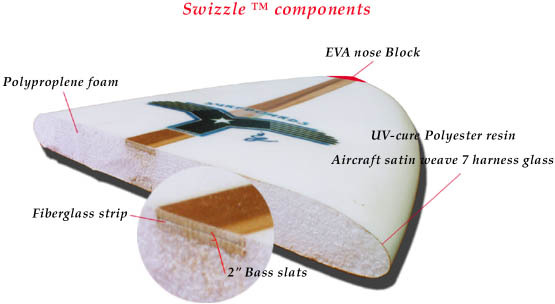 As an added safety feature soft EVA water proof foam is used for nose and tail blocks. Same material as used in kick boards. The SWIZZLES advanced feel is produced by its new array of high performance materials, and also formed from its revolutionary SWIZZLE shape. Contact them today or check the Web site for all the particulars. Showroom: 34206 Sepulveda Ave, Capistrano Bch. Jimmy Gamboa streaks at Malibu on the new YHP5 SWIZZLE stretching it way out onto the shoulder and holding it.